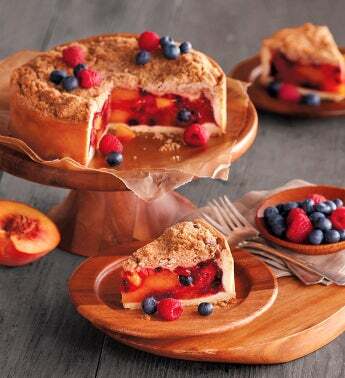 An American classic, our deep-dish, country-style Peach and Berry Pie arrives ready to thaw and serve. This fruit pie boasts the sweet and unmistakable flavor of premium peaches, plus the tart flavor of ripe, firm blueberries and raspberries. These delicious fruits are arranged in a deep-dish pastry shell and topped with cinnamon and sugar streusel.